Speeches – Thomas Graham, Jr.
“Hot Spots of the World from North Korea to Iran.” Rotary Club. Frankfort, Kentucky. 26 Apr. 2018. “Nuclear Non-proliferation, the Past, Present and Future.” Netherlands, The Hague. 23 Mar. 2018. “Nuclear Weapons and a Different World” Sandia National Laboratory, Albuquerque, New Mexico. 14 Dec. 2016. 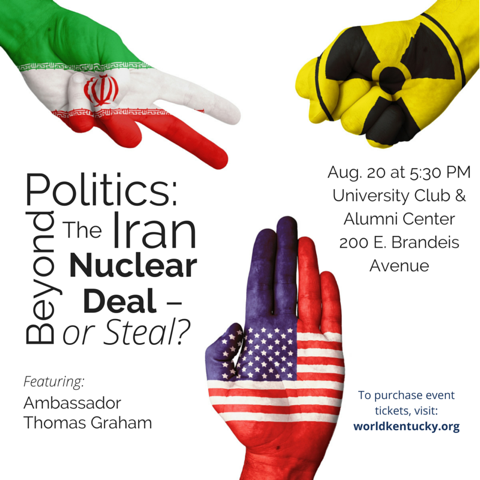 Announcement, Flyer, Press Release for “Beyond Politics: The Iran Nuclear Deal–or Steal?” World Affairs Council Kentucky and Southern Indiana. University Club & Alumni Center, Louisville, KY. 20 Aug. 2015. (With Davis Robinson and Missy Ryan) “The Deal with Iran.” Nonproliferation Arms Control and Disarmament Interest Group (NACDIG), International Law Committee for the United Nations Association-National Capital Area (UNA/NCA), American Society of international Law (ASIL). Washington, DC. YouTube. 20 May 2015. “Agreement with Iran: The Future.” Ambassadors Perspectives. 2015. “Arms Control and Disarmament, a Perspective 2014.” University of Washington. Seattle, WA. 5 Dec. 2014. “The Nuclear Non-proliferation Treaty Under Threat.” Albuquerque, NM. 21 Jan. 2014. Address. United Nations. NY. 28 Oct. 2013. “Nuclear Weapons and International Security; the Threat of North Korea.” The University of Louisville. Louisville, KY. 16 Apr. 2013. “Nuclear Weapons and the Future of Civilization; the Intersection of Science, Politics and International Law.” Conference on Global Challenges. Drexel University. Philadelphia, PA. 1 Mar. 2013. “National Security and the Rule of Law.” Center for Ethics and the Rule of Law, University of Pennsylvania Law School, Philadelphia, PA. 11 Sept. 2012. “The Future of Nuclear Power.” Bariloche, Argentina. 29 Apr. 2011. “Small Modular Reactors and Nuclear Nonproliferation.” Oak Ridge National Laboratory. Oak Ridge, TN. 8 Feb. 2011. “Nuclear Disarmament and the Future.” United Nations Regional Workshop for East and Southeast Asia, Beijing, China. 20 Jan. 2011. “Nuclear Disarmament and the Future.” Seattle, Washington. 9 Dec. 2010. 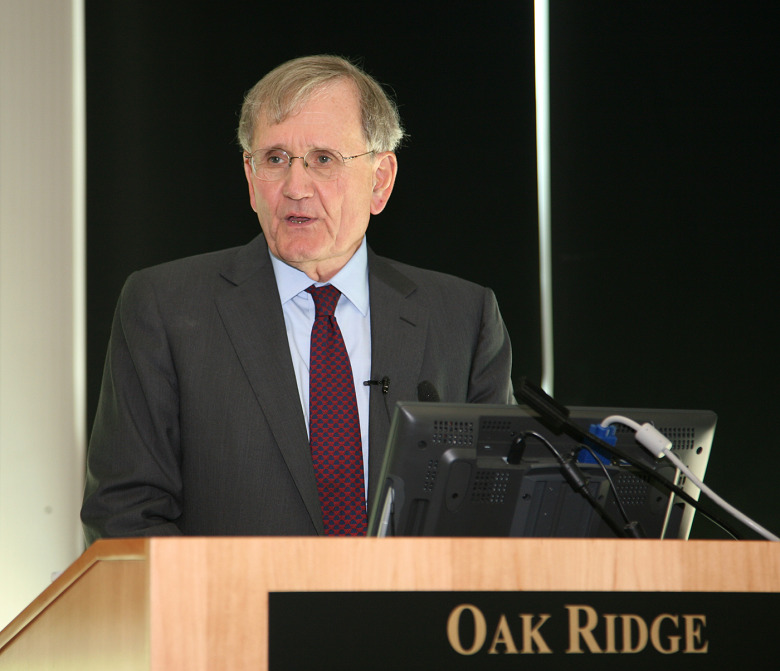 “Nuclear Weapon Policy and International Law.” Oak Ridge National Laboratory. Oak Ridge, TN. 9 Aug. 2010. “Iran’s Nuclear Program and its Implications for International Security.” Friedrich Ebert Foundation. Berlin, Germany. 20 May 2010. “The Nuclear Nonproliferation Treaty and International Peace and Security.” Egyptian Council for Foreign Relations. Cairo, Egypt. 12 May 2010. “FES Forum on Security Policy: New Momentum for Disarmament Toward a World without Nuclear Weapons.” Berlin, Germany. 22 Apr. 2009. “Nuclear Weapon Challenges for the New Administration.” Dallas Council on Foreign Relations, Dallas, TX. 27 Feb. 2009. “Zero Nuclear Weapons and the International Nuclear Nonproliferation Regime.” Mid Coast Forum on Foreign Relations, Samoset Resort, Rockport, ME. 26 Jan. 2009. “The Road Ahead.” Philadelphia, PA. 22 Oct. 2008. “Faith and Peace: Anne Frank—A Living Legacy.” Hyde Park, NY. 7 May 2006. “The Nuclear Non-Proliferation Treaty and a Strategy for Effective Non-Proliferation.” Royal Institute of International Affairs, Chatham House, London. 5 Nov. 2004. “Challenges to the NPT Regime.” Stanford University. Stanford, CA. 1 June 2004. “National Self Defense and International Law.” William Mitchell College of Law. St. Paul, MN. 18 Mar. 2004. “Future of International Coorperation in Space.“ National Security and Military Space Workshop. Kirtland AFB, NM. 8-9 July 2003. “Arms Limitation and the International System.” Everett, WA. 23 May 2003. “The Nuclear Non-Proliferation Treaty and Nuclear Power Workshop on Enhanced Proliferation Resistance and Safeguards Technology for Nuclear Energy.” Washington, D.C. 20 May 2003. “Comprehensive Nuclear Test Ban Treaty and the Issue of Nuclear Testing.“ Los Alamos National Laboratory. 5 May 2003. “Comprehensive Nuclear Test Ban Treaty and the Survival of the Nuclear Non-Proliferation Treaty.” Comprehensive Test Ban Treaty Organization. Vienna, Austria. 3 Apr. 2003. “Nuclear Nonproliferation and Nuclear Terrorism.” Chevy Chase Club, Chevy Chase, MD. 13 Mar. 2003. “Is There a Future for Arms Control and Disarmament?” University of Louisville. Louisville, KY. 15 Apr. 2002. “Ballistic Missile Defense and the Non-Proliferation Treaty Regime: A View from Washington.” Diplomatic Academy of the Ministry of Foreign Affairs. Moscow, Russia 27 Mar. 2001. “U.S. National Security Policy: the Road Ahead.” Stanford, CA. 7 Feb. 2001. “Law, Politics and the ABM Treaty.” National Institute for Public Policy, Washington, DC. 7 June 2000. “Protecting Europe and the NPT Regime: NMD and NATO Nuclear Weapon Use Policy.” Institut Francasi de Relations Internationales. Paris, France. 23 Mar. 2000. “NATO Security in the 21st Century: De-Legitimizing Weapons of Mass Destruction.” NATO Defense College. Rome, Italy. 14 Jan. 2000. “Strengthening the NPT and the Review Process.” To a Program for Promoting Nuclear Non-Proliferation Workshop on The Tough Challenges Facing Nuclear Non-Proliferation. Hosbjor, Norway. 12 Dec. 1999. “The Multilateralization of Arms Control, Non-Proliferaton and Disarmament: The Role of NOGs and the Track II Process.” Agency for the Prohibition of Nuclear Weasons in Latin America & the Caribbean (OPANAL) General Conference. Lima, Peru. 3 Dec. 1999. “The Future of the Non-Proliferation Treaty Regime.” The Commonwealth Club of California, Silicon Valley. San Jose, CA. 9 Nov. 1999. “Nuclear Non-Proliferation in the 21st Century: Reducing the Political Value of Nuclear Weapons.” University of Washington. Seattle, WA. 30 Oct. 1999. “The U.S. Political Process and NATO States: The Impediments to Abolition.” Symposium: The Way Forward: Developing Legal and Political Strategies to Abolish Nuclear Weapons. Simon Frasier University, Vancouver, BC. 29 Oct. 1999. “Nuclear Non-Proliferation and National Security.” National Defense University. Washington, DC. 22 Sept. 1999. “Japan and Nuclear Disarmament in the 21st Century: The Tokyo Forum for Nuclear Non-Proliferation and Disarmament.” Hiroshima Peace Institute. Hiroshima. 18 Sept. 1999. “Remarks on the CTBT.” The Office of Byron Dorgan. Washington, DC. 2 July 1999. “The Future of Nuclear Disarmament: Necessary Steps.“ Institut de Relations Internationales et strategiques. Paris, France. 5 May 1999. “Non-Proliferation in the Middle East.” Washington, DC. 26 Apr. 1999. “The Role of Multilateral Export Control Regimes in Preventing Proliferation of Weapons of Mass Destruction.” Moscow, Russia. 20 Apr. 1999. “The Canadian Parliamentary Report on Lowering the Political Value of Nuclear Weapons.” Cleveland, OH. 7 Apr. 1999. “Nuclear Non-Proliferation Strategy in the Post Cold War World.” The National Strategy Forum. Chicago, IL. 6 April 1999. “The Future of Nuclear Weapons.“ The American Society of International Law, Washington, DC. 27 Mar. 1999. “The Prospects for Five Power Negotiations on Disarmament.“ Mexico City, Mexico. 2 Feb. 1999. Remarks. Carnegie International Non-Proliferation Conference. Washington, D.C. 12 Jan. 1999. “Updating NATO’s Nuclear Doctrine.” Old Ebbitt Grill. Washington DC. 21 Dec. 1998. “Nuclear Materials Management and the NPT.” Center for Strategic and International Studies. Washington, D.C. 4 Dec. 1998. ‘”No First Use: The Time Has Come.” New York, NY. 27 Oct. 1998. “The Legal Status of the Anti-Ballistic Missile Treaty.” Washington, DC. 22 Oct. 1998. “Nuclear Maturity in Argentina and Brazil.” SAIC Argentina and Brazil Rollback Workshop. McLean, VA. 22 Oct. 1998. “Achieving Small Arms Control“. The United Nations, New York, NY. 25 Sept. 1998. “The Prospects for Global Disarmament.” New Delhi, India. 16 Sept. 1998. “The First Use: The Time Has Come.” Ottawa, Canada. 27 March 1998. “Coming Attractions: the Arms Control Agenda for 1997.” Stanford University. Stanford, CA. 31 Mar. 1997. Remarks. LAWS / American Bar Association Nuclear Export Control Workshop. Beijing, China. 12 March 1998. Remarks. Moscow, Russia. 14 Feb. 1998. “Maintaining America’s Strategic Interests.” U.S. Foreign Policy Regional Town Meeting. U.S. Department of State and The World Affairs council. The Madison Hotel, 515 Madison Street, Seattle, WA. 29 Apr. 1997. “Status of FMCT and START III.” Los Alamos National Laboratory. Los Alamos, NM. 22 Apr. 1997. “The Future of Nonproliferation Regimes.” 22 Apr. 1997. “Weapons of Mass Destruction: Threats and Possible Solutions.” Albuquerque Commmittee on Foreign Relations. Albuquerque, NM. 21 Apr. 1997. “The Enduring Value of Arms Control.” Seventh Annual Arms Control Conference. Albuquerque, NM. 18 Apr. 1997. “Reducing the Threat of Nuclear Weapons.” Sandia National Laboratory. Albuquerque, NM. 12 Apr. 1997. “Talking Points on the Future of Nonproliferation Regimes.” Lawrence Livermore National Laboratory. Livermore, CA. 2 Apr. 1997. The 1997 Multilateral Arms Control Agenda and ACDA Priorities.” 14th Annual NACD Verification Symposium. Quebec, Canada. 13 Mar. 1997. “Arms Control and Nonproliferation Challenges in Northeast Asia.” Center for War, Peace, and the News Media and the Center for International Strategy, Technology and Policy. Atlanta Renaissance Hotel, Atlanta GA. 21 Feb. 1997. “The Role of Nuclear Weapon-Free Zones,” Mexico City, Mexico. 4 Feb. 1997. “Legal Aspects of Post-Cold War National Security Threats: Controlling Weapons of Mass Destruction.” Conference on National Security Law in a Changing World. 9 Dec. 1996. “Remarks of Thomas Graham Delegation of the United States of America on the Draft Southeast Asian Nuclear Weapon Free Treaty Zone.” Djkarta, Indonesia. Oct. 1996. “Terrorism and the Proliferation of Weapons of Mass Destruction.” Law Enforcement & Intelligence Conference. American Bar Association. Hotel Washington, Washington, DC. 19 Sept. 1996. “Making the NPT Work: Checking Proliferation and Eliminating Nuclear Weapons.” Plenary Session Five, Asia-Pacific Rountable. Kuala Lampur, Malaysia. 5-8 June 1996. “Importance of a CTBT to the NPT Regime.” Plenary Session on Nuclear Testing and a Comprehensive Test Ban. The Defense Nuclear Agency’s Fifth Annual International Conference on Controlling Arms, Norfold, VA. 5 June 1996. “The 1995 NPT Review Conference: Implications for the Future.” Conference on Nuclear Nonproliferation Issues. Air War College, Maxwell Air Force Base, AL. 27 Apr. 1996. “Modern Arms Control Diplomacy: A Historical Perspective.” The Diplomatic Institute. Cairo, Egypt. 9 Mar. 1996. “The United States Nonproliferation Agenda After 1995.” Monterey Institute for International Studies. Monterey, CA. 29 Nov. 1995. Program for The Fifteenth Jit Trainor Award for Distinction in the Conduct of Diplomacy. Institute for the Study of Diplomacy. Edmund A. Walsh School of Foreign Services. Georgetown University. Washington, DC. 3 Oct. 1995. Acceptance Speech for Jit Trainor Award for Distinction in the Conduct of Diplomacy. “The Diplomatic Lessons Learned from the Renewal of the Treaty on the Non-Proliferation of Nuclear Weapons.” Institute for the Study of Diplomacy. Edmund A. Walsh School of Foreign Services. Georgetown University. 3 Oct. 1995. Keynote Addresss. “Beyond The NPT Regime.” Carnegie Endowment for International Peace.Yurakucho Asahi Hall, Asahi Shimbun, Tokyo. 31 May 1995. Event Announcement. “Indefinite Extension of the Nuclear Non-Proliferation Treaty: Beating the Odds.” The Atlantic Council of the United States. The Atlantic Council Conference room, 11th floor, 910 17th Street, N.W., Washington, DC. 24 May 1995. Speech. Woodrow Wilson Center. Washington, DC. 17 May 1995. “The 1995 NPT Conference–An Historic Opportunity for International and Regional Security“. Organization of American States Special Committee on Hemispheric Security. Washington, DC. 3 Mar. 1995. Press Release. “The United States Commitment to Indefinite Extension without Conditions of the NPT is Unwavering.” Committee for the 1995 Conference of the Parties to the Treaty on the Non-Proliferation of Nuclear Weapons. 26 Jan. 1995. Press Briefing. “The unwavering position of the USG on Indefinite Extension without Conditions of the NPT.” United Nations Room 226. New York, NY. 26 Jan. 1995. “African and American Perspectives on the NPT.” African-American Institute and the Campaign for the NPT. Washington, DC. 23 Jan. 1995. “Non-Proliferation: Points of View of Latin America and the Caribbean.” Agency for the Prohibition of Nuclear Weapons in Latin American and Caribbean (OPANAL) Seminar. Cancun, Mexico. 12 Jan. 1995. “The Future of Arms Control in the Middle East.” Jaffee Center for Strategic Studies. Tel Aviv University, Tel Aviv, Israel. 1 Dec. 1994. [Outlook for Non-Proliferation Treaty]. American Nuclear Society. Washington, DC. 15 Nov. 1994. [US Policy of Nonproliferation of Weapons of Mass Destruction.] Colby College, Waterville, ME. 30 Sept. 1994. “Third Meeting of the Preparatory Committee for the 1995 Conference of the Parties to the Treaty on the Nonproliferation of Nuclear Weapons.” 13 Sept. 1994. “The Extension of the NPT.” American Bar Association and Center for National Security Law Conference on Nonproliferation of Weapons of Mass Destruction, Washington, DC. 10 June 1994. Address. Sixth UN Meeting on Peace and Disarmament in the Asia-Pacific Region. Kathmandu, Nepal. 31 Jan. 1994. “Second Meeting of the Preparatory Committee for the 1995 Cimmittee for the 1995 Conference of the Parties to the Treaty of the Non-Proliferation of Nulear Weapons” 21 Jan. 1994. Keynote address. “Some Personal Observations on Proliferation in the 1990’s.” Armed Forces Communications and Electronics Association (AFCEA). 7 June 1993. Notes. Remarks at Retirement fr. Arms Control and Disarmament Agency (DACHA). 1 July 1979.